I’ve been a little antipathetic toward today’s touchstone author since the early 90s when, at the end of his productive scholarly life, he was unable to transcend what I presume was his fear that the radical post-modern critique would forever doom archaeology to ‘wallowing in minutiae’ and thereby contributing nothing of lasting scientific merit to our knowledge of past peoples’ lives, of what brought about culture change, and of the anthropological value of the archaeological record. 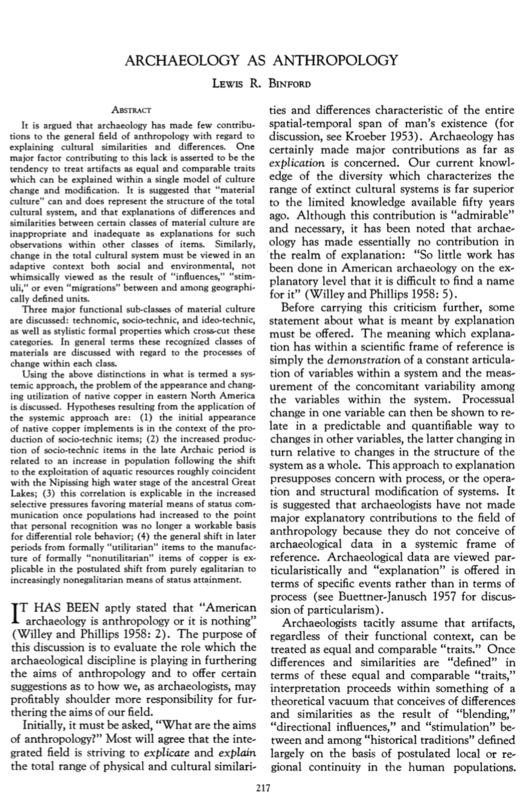 I remember reading Lewis R. Binford’s ‘Archaeology as Anthropology’ as an undergraduate, and finding it difficult to understand the first time around. As I’ve since learned (and as faithful SA readers will remember) he was a famously awful writer, and my inability to grasp what he was saying probably had as much to do with his prose as it did with his propositions. Today’s generation of archaeologists, if they’ve had only a glancing encounter with Binford’s thoughts, will find this article rife with arcane terminology borrowed mostly from Leslie White, but also from Julian Steward. These two had been informed as much by evolutionary theory as by Marx’s materialist philosophy, and without exhibiting any of Marx’s politics (which would have been fatal in the 1950s climate of red-baiting and black-listing), they nevertheless incorporated Marxian social and material frameworks in their anthropological schemae. So, the reader will encounter the words technomic, sociotechnic, and ideotechnic in this article. These constructs, I think, helped Binford make sense of what early theorists, like Walter Taylor, and later ones, like Ian Hodder, would call the ‘context’ of an object–its meaning within the cultural milieu. Archaeologists of the Late Palaeolithic, Neolithic, Chalcolithic and Bronze Ages in Europe will recognize the cultural transformation of utilitarian objects into symbols of status because that’s exactly what happened in their archaeological neck-o-the-woods. 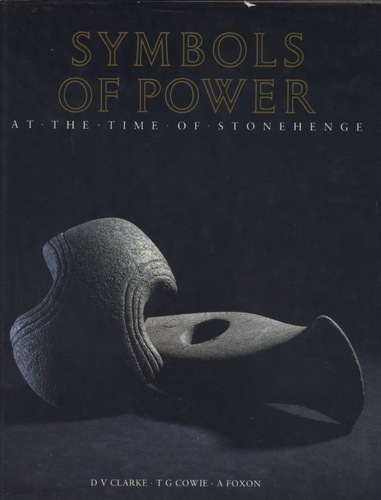 For those of you not familiar with those times and places, have a look some time at the exquisite pictorial volume Symbols of Power at the Time of Stonehenge, the cover of which is reproduced below. As the entire contents of this book reveal, the time of Stonehenge was a time when an axe was no longer just an axe, nor an archer’s kit just a mundane component of the life and times of the archer. You get a glimpse of the power with which an everyday construct–like ‘axe’–can be imbued with such symbolic power in the beautifully shaped stone artifacts in the cover photo. It’s easy to imagine that these articles may never have seen the trunk of a tree or the head of a foe. So, read this classic by Binford as a way of gaining entry into the meaningfully constituted worlds of the past. Then sleep on it for about 30 years, as I have, and you’ll come to regard ‘Archaeology as Anthropology’ as a small step for the man, Lewis R. Binford, but a giant leap for archaeology and anthropology. This entry was posted in Archaeological theory, Archaeology as Anthropology, Binford, Bronze Age, Chalcolithic, Culture theory, Late Palaeolithic, Late Paleolithic, Neolithic, Old Copper complex. Bookmark the permalink.